Remembrance Day is observed in Canada and most of the Commonwealth nations, (barring some countries like India), on 11 Nov (11/11). At 11 minutes past 11 o’clock, all the buses and trains will stop, the fire engines will sound their sirens for a minute as a mark of respect to all the fallen soldiers. Remembrance Day (also known as Red Poppy Day,) is a memorial day observed since the end of World War I to remember the members of the armed forces who have died in the line of duty. It is an irony that in India, we have no national war memorials. India Gate at Delhi was constructed by the British in memory of all the Indian soldiers who sacrificed their lives during the First World War. In India, we have days earmarked to remember and pay respects to anyone and everyone, but none to remember our veterans and soldiers who laid down their lives for the safety and honour of its citizens. In India we remember our soldiers only at the time of war and forget them soon after. Our governments over the time have been unfair to the Armed forces and have brought down the status of the Army Chief after every war fought by the Indian Army – . After the 1947-1948 war, the service chiefs were made junior to the Judges of the Supreme Court. They were made junior to the Cabinet Secretary after the 1962 war and junior to the Attorney-General after the 1965 war. After the 1971 war, they were made junior to the Comptroller and Auditor-General. The red poppy has become the emblem of Remembrance Day due to the poem “In Flanders Fields” by Lieutenant Colonel John McCrae, a doctor of the Canadian Army during World War I. During the war, he was treating injured men – Canadians, British, Indians, French, and .Germans. The poem was written to vent the agony felt by McCrae after he had performed the funeral ceremony in the absence of the chaplain, for his young friend and former student, Lieutenant. Alexis Helmer caused by a bomb. In the poem McCrae describes about the poppies that bloomed across some of the worst battlefields of Flanders in World War I, their brilliant red colour an appropriate symbol for the blood spilled in the war. The poem speaks of Flanders fields, but the subject is universal – the fear of the ones who sacrificed their ‘today’ for our ‘tomorrow’, that they will be forgotten, that their death would have been in vain. Remembrance, as symbolized by the Red Poppy, is our eternal answer which belies that fear. An American teacher, Moina Michael, in November 1918, read McCrae’s poem “In Flanders Fields”. She immediately made a personal pledge to keep the faith and vowed always to wear a red poppy of Flanders Fields as a sign of remembrance and as an emblem for keeping the faith with all who died. Two years later in 1920, during a visit to the United States, a French woman, Madame Guerin, learned of the custom. On her return to France, she decided to use handmade Poppies to raise money for the destitute children in war-torn areas of the country. Following the example of Madame Guerin, The Royal Canadian Legion officially adopted the Poppy as its Flower of Remembrance. Thanks to the millions of Canadians who wear the Legion’s lapel Poppy each November, in memory of thousands of their countrymen who died in battles (except many who emigrated from the Indian sub-continent). During the Remembrance week, all the flags fly at half-mast; all the buses have “Lest We Forget” signboards, most of the shops, restaurants and malls display banners and posters to honour the soldiers and veterans. On the Sunday of the Remembrance Week I attended the Holy Mass at the Canadian Catholic Church and the Orthodox Syrian Christian Church. In the Catholic Church anyone and everyone including the clergy, all were wearing the Red Poppy, whereas in the Syrian Christian Church none were wearing. You all can guess the reasons. One always passes by the veterans and cadets selling the Red Poppy in the malls, bus terminals, subway/railway stations, during the Remembrance Week. The money collected is used for veterans’ welfare by the government. The public support for the event is always overwhelming where ever they have Remembrance Day ceremonies. People turn up in large numbers. The media support is also tremendous. All news presenters, anchors, all wear the Red Poppy for the entire week. Have you seen any Indian news presenters or any media person ever wearing the Flag on the Flag Day (Indian equivalent of Red Poppy Day)? 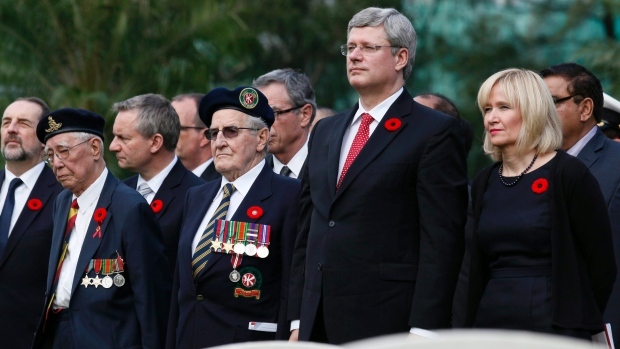 Canadian Prime Minister and the entire cabinet, would appear on any media, wearing the Red Poppy. In India, on the Flag Day, children pin the flags on our President and the Prime Minister and Chief Minister, and for the next event you see them without the flags on their chests. So, next time you see someone selling the Red Poppies or Flags, please pause and buy one and pin it with pride on your chest, to pay respect to those fallen soldiers all over the world who ensured your honour and safety and made sure that you live a life full of dignity. As a young girl I remember attending this function at the Digboi War Cemetary in Assam. As I was from a ‘civilian’ background, I was greatly moved by the poignant and impressive function. I am not sure if this is carried out now, but I sincerely hope it does!